Last week, Facebook has started rolling out Graph Search among English language users in the US. Throughout the week and over the weekend, other Facebook users from around the world have received the update. 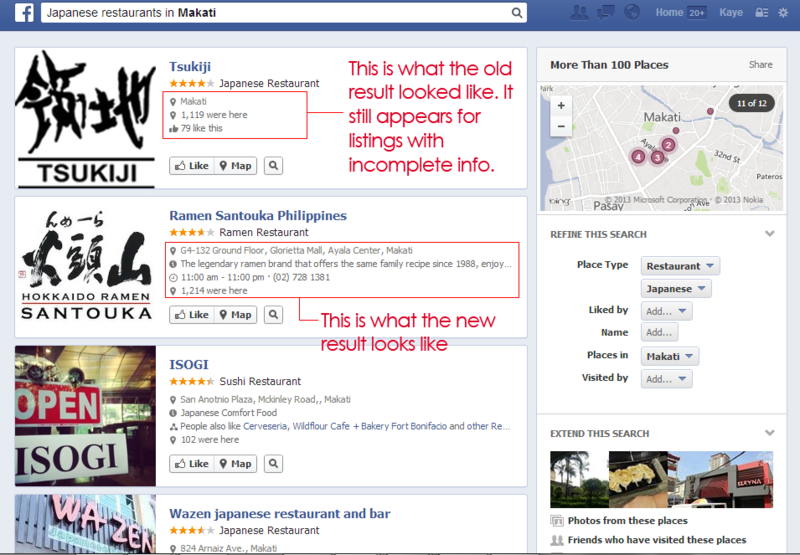 Some features have changed since Facebook first gave a preview of what Graph Search would be like – here’s a quick tour. The appearance of the search box has changed. Before, you need to type something before Facebook suggests people, pages and apps related to your search. Now, you only need to click on the search bar to make the suggested searches appear. 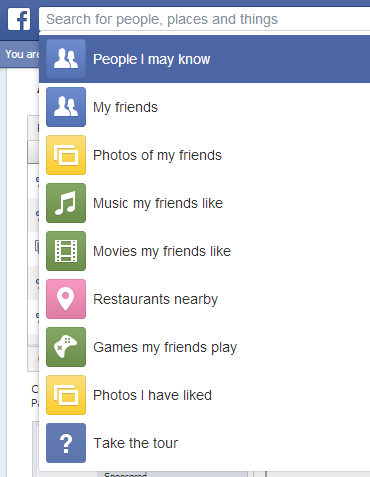 The suggested searches feature categories shown in Facebook’s earlier demo, but two new categories have been added – “Movies my friends like” and “People I May Know.” According to Facebook, they’re still experimenting with the order of the suggested searches according to user search behavior, and the current arrangement may change later on. Graph Search’s understanding of synonyms, syntax, and contextual meaning was limited in the earlier version. In Facebook’s official newsroom, the social network noted that “Graph Search understands more ways of asking questions.” In the example Facebook provides, Graph Search can now understand the query “restaurants nearby San Francisco.” The previous version of Graph Search could only understand “restaurants nearby” and “restaurants near San Francisco. As a result, they can now provide accurate answers for queries phrased differently. 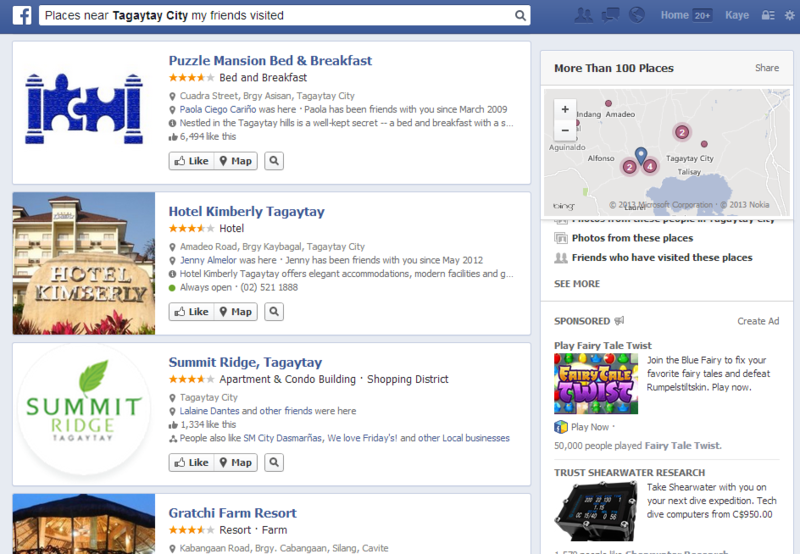 In the example above, I typed “places nearby Tagaytay City my friends have been to” and the suggested query you see in the screenshot above appeared. Longer queries and more specific place searches need more work (I still got a “Your search returned no results” for some of the longer, more specific queries) but you can expect this to improve as Facebook further refines the feature. As you can see, pages with incomplete information still show the old results format, one where the last item shows how many people like the page. Those with complete information show the address, a snippet of the “About” section, operating hours and contact info, and how many people have been there. This should be a heads-up to all business owners – optimizing and completing your business information is more important than ever if you want to get found. The results page also shows an option to refine the search, which was in the earlier version, and an “Extend This Search” section, where you can view photos relevant to your search, among other things. Part of Facebook’s determining factor for displaying results is how recent a post, a photo, or an updated listing is, which is why regular updates are important to be found on Graph Search. These are the changes in Graph Search so far. Because one search displays different types of results, it’s important that you optimize everything you post on Facebook to make sure users find you consistently. Talk to us today to get started.